I can't find this character in the dictionary. What is it? Where did it come from? The character is made up for a dialectical word qiǔ. Constructed as「⿱穷土」, the definition is dirt-poor (「穷」到吃「土」), and the prescribed reading qiou is a Fanqie-like combination of 「穷」(qiong, poor) and「丑」(chou, awkward, messed-up, ugly), because the bottom of the character resembles「丑」. (Self-deprecatingly) What is dirt poor or both poor and ugly? ME! See the baidu reference. However, this may be folk etymology. A new Chinese character, invented by netizens, has become massively popular on social media this week - especially among self-mocking millennials. According to Shanghaiist, the character 'qiou' is a combination of three characters - 'qiong', meaning poor, 'chou', meaning ugly, and 'tu', meaning earth. Taken together, the character essentially means "poor as dirt and ugly." reading of 我 is a joke: 写作'穷丑' 读作 '我' (written as '穷丑' read as '我') = "I am the definition of poor and ugly"
Since 穷 is a simplified character, the origin of this made-up character should be Mainland China. You can't find it in dictionary because it is not a real character. Not the answer you're looking for? Browse other questions tagged meaning characters or ask your own question. 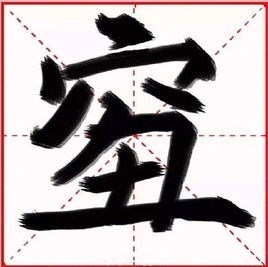 What and where is the connection between 压岁钱 and the character 岁 that appears in it? What is a one-character translation of the English word “Freedom”? Character 瞓: where did the pronunciations come from? Can you decipher what this seal stamp says and means? Is there any evidence that 90% of characters are phono-semantic compounds?